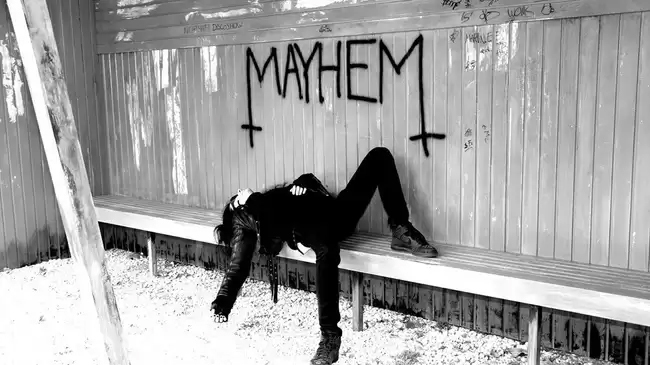 I recently watched Lords Of Chaos about a Norwegian Black Metal band called Mayhem. The film tells the story of Mayhem and it’s founder Euronymous. During the early 90’s there was a spate of church burnings which were primarily at the hands of Mayhem. The band were dedicated Satanists and believed they were genuinely fighting to free Norway from the clutches of Christianity in order to bring back ancient Viking practices and rituals. Euronymous became a key figure in the Black Metal scene in Norway, owning a record shop called Hell which became a central hangout for kids in the scene. The Black Metal scene in Norway was undoubtedly disturbing and dark however the maker of Lords of Chaos, Jonas Åkerlund, uses more a little creative license when it comes to filling in gaps in the real story, so in some ways it’s not an accurate depiction of what really happened. This is a bit disappointing since he himself was a founding member of Swedish Black Metal band Bathory, as well as directing videos for bands such as Candlemass and Metallica. However, if you ignore the parts of the film that aren’t actually true, the film is certainly entertaining, although it is shocking to watch in some places. Whilst the film doesn’t go into Norway’s relationship with Christianity in general, which must surely be a tumultuous one at best, with their Norse history, I do think that needs to be explored. The proliferation of Black Metal in Scandinavia doesn’t seem accidental and its draw seems much to do with its connection to Satanism. Although it must be said that Black Metal pioneers, Venom, used Satanism merely for drama and were not actually practising Satanists. However when the music genre become popular in Scandinavia, the Satanism aspect was clutched eagerly with both hands by bands and audience alike. Overall though the film is worth watching in my opinion and if you like Black metal you will certainly enjoy the music throughout.